Data centers need to be more agile than ever, as IT increasingly becomes a strategic asset that determines how well an organization interacts with its customers, suppliers and employees. Yet with today's constrained budgets, IT administrators must ensure that their hardware investments deliver optimal ROI and help reduce operational expenses at every level. 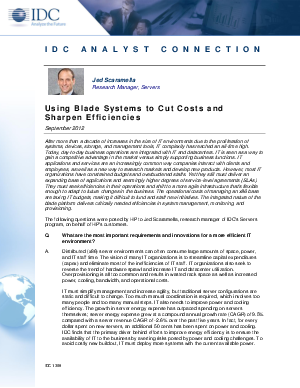 In this IDC Analyst Connection white paper, server expert Jed Scaramella discusses how to address the challenges of data center inefficiency. Check out this paper to gain insight into how the latest innovations in server blade technology are enabling IT administrators to optimize their infrastructures while saving money.